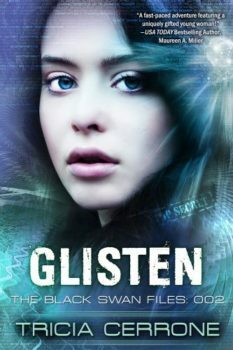 Gold Medal Winner, Glimmer, launches The Black Swan Files! The accident that gave Jocelyn new powers also killed her family. In their place she is raised at Camp Holliwell by her “uncle”—a government funded scientist—and his league of doctors who study and test Jocelyn daily in the hopes of learning how to replicate her. The military has another goal in mind—to make her an asset. This field trip had been doomed from the beginning. The muzzle of a gun pressed to Sunnie’s temple. It had been used recently. She could tell by the heat on her skin and the burning scent assaulting her nose. Her heart did a triple beat vibrating in her ears. There had been other signs that pointed toward doom, but the gun definitely confirmed it. She heard a young girl cry for her mother and breathed with control, surprised that all the years of meditation actually helped when it mattered. The girl cried out again. Sunnie heard and felt the kid’s terror. It was the only reason she wasn’t safely in the elevator, heading to the truck. She would not be telling her uncle that part of today’s misadventures. Her uncle worked at Camp Holliwell, a high tech, high science, highly militarized zone secured deep in the Virginian mountains. Because of Sunnie’s unique abilities, she was sometimes called upon to assist Uncle Laurence’s colleagues. He called them field trips so as not to frighten her. And nothing had frightened her. She liked the opportunity to go somewhere, anywhere, off Camp Holliwell. As she got older and the outings became more militarized, she understood them for what they were—secret missions. For her uncle’s sake, she pretended they were still harmless field trips. It was harder to pretend with a gun to your head, but she wasn’t about to let one man ruin her chances to attend the next mission. From the corner of her eye, she identified a ghoulish, full-face oxygen mask—another sure sign that things were about to get worse…and she was going to need that mask. She might need the gun, too. Sunnie wasn’t allowed to carry weapons as a matter of policy, and a family rule. Granted, she’d never been on a field trip where she really needed a weapon. Her job, in general, simply relied on her super hearing and language skills. In a world where every room was scanned for listening, probing, and picture devices, non-detectable solutions were in demand. She had only to sit in the suite next door and repeat what was being said. Today, that amounted to conveying instructions about the transport of a high-risk “asset.” Easy peasy, safe and breezy. Only now, she wondered what that asset was. Apparently, a lot of people wanted it. She swallowed the lump in her throat and held her hands up in surrender when her assailant pushed the gun harder against her head. She went through a visual picture of what she needed to do next. She tuned her ears into every sound, searching for clues in her surroundings to guide her. The heartbeat of the man next to her surfaced the loudest. It beat louder and faster than her own. Perhaps his mission was doomed as well. The thought reassured her and gave her courage. A loud crash distracted her attention from the immediate danger. Medina flew out the door of a hotel room, his body thudding hard against the wall on the other side of the hallway. Wood and plaster sprayed around him, making her think he might have actually gone through the door. Medina was her handler—a military protector who got her in and out of field trips. He wasn’t supposed to be flying through walls or doors. Lucky for him, she’d been delayed by her buddy to the right. Maybe this trip wasn’t going downhill after all. Using the distraction, Sunnie stepped sharply in reverse, tilting her head backward while her right hand moved lightning fast and grabbed the muzzle with forward motion. The flash of exploding fire and the bullet whizzing past her nose were synchronous with the explosion in her ears. She cried out in pain, and her eyes squeezed shut protectively, but she knew she had to fight now and recover later. Most fights are against yourself—that’s how she’d been trained. You have to fight yourself from giving up. Her heel crushed the top of the gunman’s foot, while her right hand followed through pushing the muzzle down and against his thigh. She grabbed with her other hand, cracked the gun hard, breaking his trigger finger, and snatched the gun from his grip. Her elbow swung up at his chin, knocked the mask off kilter, and impaired his vision. She used the opportunity to kick out his knee and shoot his foot. The shooting wasn’t deliberate. It just sort of happened. Probably why her uncle didn’t want her using guns. Her assailant cried in fury at the pain and lurched toward her with a punch. She ducked, then launched upward with a chop to his throat. She grabbed the mask, pulled him forward, and hit him on the back of the neck. It was a blow that could kill or stun. She’d been careful to stun. He fell to his knees and she ripped off the mask, turning to shoot the knee of the other masked gunman going after Medina. The shot knocked him off balance and took his attention from Medina to her. She shot his gun arm next. It gave Medina time to secure his gun and pistol-whip his head. She winced as the victim flopped forward to the ground. She’d been taught to shoot at the chest or head, but…she hadn’t been planning on killing anyone today. Preferably never. Bluish gas seeped out from under the hotel room door where the cries came. She went back and shot the door of the locked hotel room until the clip in the gun was empty. She tossed the gun and shoved the rest of the way with her shoulder. Medina grabbed her arm and pulled her back violently. “They need help,” she said. The mask muffled her voice, so it wasn’t clear he understood until he checked out the room, nodded, then stood guard. Huh. Not so heartless after all? The room was a large suite, and through the blue smoke, Sunnie spotted a woman unconscious on the floor with a little girl screaming, desperately pulling her woman’s arm. Nothing in her last nine years prepared her for what happened next. The memory rocked her. Sunnie lost balance and fell. Suddenly, she was seven again, trying to drag her mother through the gas and fire in their home, crying for help, and begging her mom to come with her. Her mother’s eyes opened briefly and then she was gone. Sunnie struggled to stay in the moment. She needed to act. Reality was a gas mask, hands and knees hugging the floor, seconds to save this woman and get to the truck. She swallowed hard, clutching weakly at the carpet as she crawled to the woman. It took an act of will to keep going, to reach the girl and her mother against the heavy weight of memories threatening to crush her mind. The girl’s crying became her own and nearly overtook her emotions. She reached the woman, and for a split second, thought she would turn the woman over and see her mother’s face. But it was a stranger. Sunnie snapped back to reality, found her breath and stood, compelling herself to pull the woman with her. It helped that she had super strength along with her super hearing. She put the woman over her shoulder and grabbed the kid with her free arm, charging out of the hotel suite toward the bank of elevators. The doors dinged open, and she faced two tall men in business suits and a blonde woman in a business dress. They gasped in surprise, the younger man stepping in front of the woman defensively when Sunnie swung the kid to her feet in front of them, and dumped the woman into his arms. She reached in and pressed the first floor. The little girl stared silent and afraid. Sunnie wished she could have done more. She couldn’t. She simply stood and held a frozen wave as the doors closed. Medina called, and she turned to join him as another elevator opened and three armed men in black suits and gas masks stepped out. The mask she wore covered her identity, but the hotel uniform she had acquired to fit in must have warned them. The instant it took them to assess was long enough for her to grab the four-foot-high decorative vase off the table and swing it like a baseball bat at the first man, sending him into the others. They, in turn, caught and flung the first man forward like a weapon. She stepped aside as the body flew into the opening elevator doors opposite and to the screams of another hotel guest holding her little dog. The dog’s ears popped up, its eyes went wide, then it buried itself in the screaming woman’s fur coat. Sunnie spun, jumped, gripped the outside frame of the elevator, and hit the men with matching kicks to their chins. One of them held a semi-automatic that shot off randomly. The screaming woman behind her got louder and more frantic. Sunnie secured the weapon and fired back into the elevator, crippling the men. Russian curses joined French curses and yippy barks. The men moved, trying to get up. The screams and barks got louder. Sunnie winced at the noise, trying to think. The first man lie half in the elevator behind her, while the Frenchwoman frantically pressed the close button, only to have the doors open again and again at the obstacle she continued to uselessly kick. Sunnie didn’t have time for a fight, and no one was watching other than a hysterical woman, so she took the easy way out. 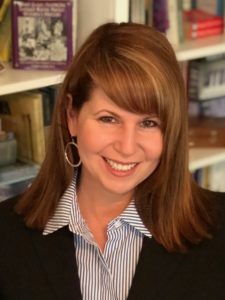 She put the gun in her belt, harnessed her energy, and swept the two men back hard into the elevator, holding them immobile with one hand while she grabbed the first man and threw him in with the others. She pressed the button for the lobby and didn’t release her focus on the men until the doors shut. The delay would only give her precious seconds, but it was enough. She pulled the firearm and ran down the hall to the other end of the building. Medina held the service elevator open with his body, gun aimed. Two more armed and masked attackers ran to the hall intersection separating her from Medina. They saw her. She stopped. They aimed. The gun in her hand choked on empty. Survival her first instinct, she broke all the rules. They wouldn’t know why they missed. Hand up, she created a shield to deftly deflect the bullets in her path, then ran up the side of the wall, flipped, and took them both out with a cartwheel kick, the heel of each foot connecting hard to their heads. She landed on her feet, low to the floor, one hand touching the carpet for balance, the bodies spread out behind her. When she looked up, Medina had his gun aimed between her eyes. For a split second, she thought he meant to use it on her, but realized he was tracking the men on the ground. He studied her, as if for the first time, then nodded to himself. Apparently, she passed his assessment. He lifted his gun high and fired. She heard the sprinkler ding. Water sprayed everywhere, soaking her before she slipped through the elevator doors. Medina grabbed her by the shirt and threw her forcibly behind him while he unloaded on the trio from the elevator, hobbling, but bearing down on them, nonetheless. She wanted to protect him or help him, but knew better. She never used her powers publicly. It was against the rules. And though Medina knew she had some skills, he didn’t know the full extent. She pressed against the elevator wall as they safely dropped to the lower levels. She’d broken a lot of family rules today. She bit her lip wondering what kind of trouble she’d be in. Today had been a near disaster, but she wanted to do more field trips. Sometimes she got a glimpse of the outside world that she would tuck away for herself until she could figure out where she had been. She knew where they were today. She’d seen out one of the hotel windows earlier. The giant Eiffel Tower had been in her history book. It was a small reward no matter what happened when she got home. She took off her mask when they reached garage level. Medina didn’t speak, so neither did she. At the garage, he wrapped their masks in his white room service jacket, and they walked casually to the awaiting laundry truck—Medina with his usual cocky saunter. He lifted the back sliding door, tossed in the masks, then “helped” her. She landed with a hard thud. The driver took off. Medina patched them into HQ. “Did we get the target?” she asked. “Didn’t need your help.” He said a few more choice words as they took a hard corner. “We can hear you,” Medina said. The communication went dead. Medina turned the Comm off and sat back, ignoring her. Medina was in his early twenties, not that old. He’d been in the military six years, but his eyes held the wisdom and misery of a much older, long-suffering soul. He raked a hand through a flop of thick, black hair. Most military had crew cuts, but the ones who did spy missions had to look more like ordinary people. Medina was anything but average, unless you compared him to an ordinary thug with an unnaturally high I.Q. On the job, she’d seen him go from thug to aristocrat in the course of a few minutes. His brown skin could be that of a construction worker or an Arabian prince who spent too much time on his yacht. He was a genius of disguise. Sometimes he wasn’t bad to look at, and sometimes he was downright scary. She preferred the former. Unfortunately, with his current scowl, he was scary. She sighed and looked down. “You were supposed to get in the elevator,” he said. “I know.” She felt the heat of humiliation on her face. He lifted a heavy brow. “Well, I hoped, because we’re partners and you’re supposed to.” She smiled engagingly. Fine. She felt lame and stupid. “Yes, sir!” she mimicked stubbornly. She shrugged. It’s not like he would understand wanting to help a little girl crying for help. And she couldn’t tell anyone about that flashback to her childhood. Her uncle would have her in psychiatry for weeks prying into her brain. Some things she knew to keep to herself. It made her uncle happy that she didn’t remember her childhood or previous family. Her shoulders sunk. It was hard to stay upright when you felt so down. And there went the last of her spirits. Her uncle would not like it—at all. “There’s a reason for following orders,” he lectured. She didn’t say anything. This was her life. Whether it was the military team or the science team, there was a reason for everything. It’s just that lately those reasons didn’t seem to make as much sense as they used to. 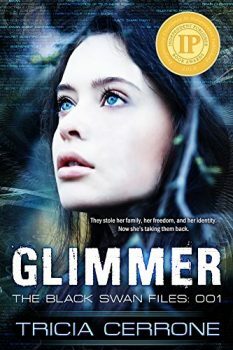 “Glimmer is a thrilling adventure set in the near future and it completely took me by surprise! The book completely holds its own in the YA genre and produces a strange mix of tech, thriller, romance and adventure, inevitably though it is a book about teen angst and self-discovery (as all good YA books are). To its benefit this book is not set in a dystopian world, instead it cements itself in a very near future with possibilities that don’t stray that far from our imagination. Perhaps that is why it is so gripping, it is unrealistic and perfectly realistic at the same time…” Read full review here.